India is a society in the grip of rapid economic and social transformation. Urbanization, unprecedented growth and a widening Indian presence on the world stage, with all its attendant demands, are profoundly reshaping Indian life. Indians both embrace this change and worry about its impact on their traditional way of life. Roughly half (49%) of Indians like the pace of modern life, while 37% object to it and 13% venture no opinion. The young, people who live in cities, the better-educated, the wealthier and those who live in the western Indian states of Maharashtra, Madhya Pradesh, Rajasthan and Gujarat are particularly accepting of the 24/7 tempo of 21st-century existence. At the same time, roughly half (52%) of Indians surveyed complain that their traditional way of life is getting lost, compared with about a third (34%) who believe it remains strong. Those most concerned about the erosion of long-established Indian traditions and mores are people living in cities and the better educated, arguably those whose life experience has most distanced them from their roots. For a plurality (43%) of Indians it is the consumerism and commercialism of the modern economy that are a threat to Indian culture. About a quarter (24%) do not agree, while a third have no view on this issue. Indians overwhelmingly believe that their way of life needs to be protected against foreign influence. 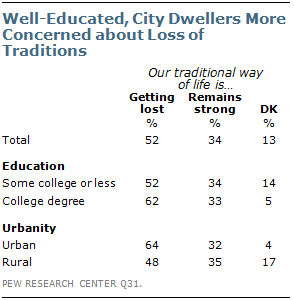 Nearly eight-in-ten (79%) want to shield their traditional culture from globalization. And half of those surveyed completely agree with such an effort. The greatest support for such cultural protectionism exists among Indians living in the western states (61% completely agree), the college-educated (59%) and those living in cities (57%). Indians strongly believe in the value of hard work. Two-in-three Indians say most people can succeed if they are willing to work hard. Such sentiment is particularly found among those with a college degree and upper-income individuals. Indian belief in the efficacy of applying oneself is comparable to that in Brazil (69%) and far exceeds that in China (45%). Since independence, when India’s first prime minister Jawaharlal Nehru pursued a course of state-led economic development, the Indian government has played a major role in both the society and the economy. Only in the wake of an economic crisis in 1991 did Delhi begin to de-emphasize the role of the public sector through deregulation, privatization of state-owned assets and an opening of the domestic market to foreign trade and investment. 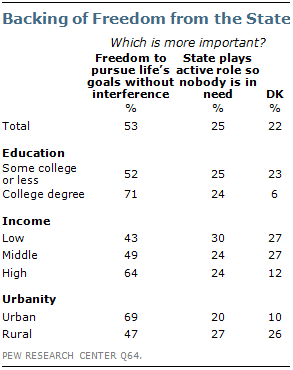 Today, the prevailing view (53%) among the Indian public is that it is more important for everyone to be free to pursue their life’s goals without government interference rather than the state to play an active role in guaranteeing that no one is in need. Such sentiment is strong among wealthier individuals, those who live in cities and the well-educated. Wary of the state, Indians are solidly committed to capitalism. About six-in-ten (61%) think most people are better off in a free market economy, even though some are rich and some are poor. 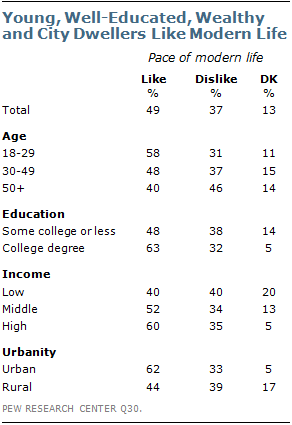 Those with a college degree and higher-income individuals are most likely to hold such views. The least support for the free market is found in the East of India, in the states of Bihar, West Bengal, Orissa and Jharkhand, some of which have a long tradition of left-wing politics. Indian enthusiasm for capitalism exceeds the 20-nation median (50%), but it still trails that in the emerging economies of Brazil (75%) and China (74%). Nevertheless, Indians think that the consequences of the current economic order are not good for the country. About eight-in-ten (81%) agree, including 57% completely, that it is true today that the rich just get richer while the poor get poorer. Such sentiment is held by men and women, across all income, age and educational groups.